::: Off the Radar :::: The Maccabees Return! 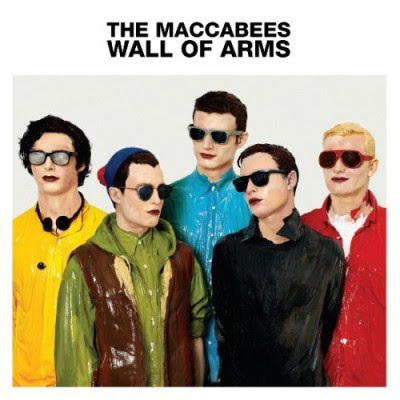 Just got the new sophmore album by The Maccabees 'Wall of Arms' thanks to my homeboy Victor Castro. Apparently it's tough to get here in the States. It's out in the UK already. Still haven't fully digested the record (probalby gonna be doing that over the week-end), but I can already tell it's pretty special, so wanted to do a post for it. The first track that caught my attention from this new album was the first single/video for 'No Kind Words' that the band released as a free MP3. Great track/video! Think it's still my favorite from the new album, but there are alot of jems on this one like 'William Powers', the heartachingly beautiful 'Love You Better', 'Can You Give It' and the slow album closer 'Bag of Bones'. I'm sure more will grow on me with time, but these are the first to catch my attention. The album cover reminds me a whole lot of Pulp's 'His N' Hers' no?? Anyways here is the video for 'No Kind Word's', plus a couple tracks from the album and a sweet dance remix that I got for 'Love You Better' by Russell Lissack. Think we may have a classic on our hands here folks, so if you like these tracks I'd definitely recommend picking this baby up. great stuff! cannot get enough of this album! You should say nothing more at all" does not always apply... but we can always use a refresher, especially in this manner.